A three quarter size mattress is approximately 48 inches by 75 inches. FREE SHIPPING: We ship these mattresses and mattress sets free to most locations in the continental USA. Special size mattresses and mattress sets take from 1 to 3 weeks to custom manufacture plus transit time. White glove delivery is a customer paid option. More shipping details below under SHIPPING. Please choose either a mattress only or a mattress set above. The mattress set includes a mattress and foundation. Hard working Americans bench build every Best Mattress For Back with quality materials in a small family owned third generation factory the old fashioned way. 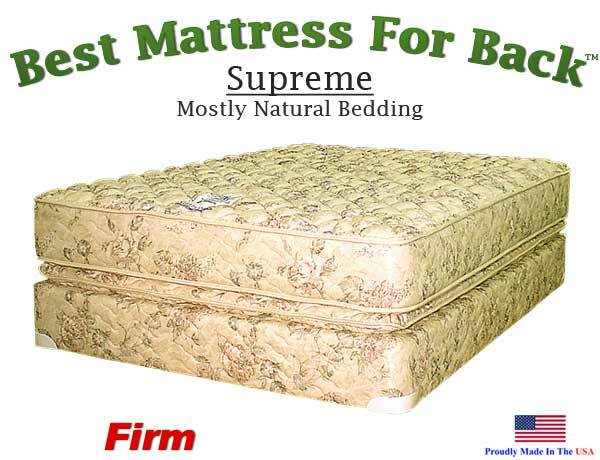 Our SUPREME mattress set is a super pillow-top/firm model. Designed around a 14.5-gauge 600 coil lura-flex spring set that offers over twice as many individually wrapped coils compared to our GOOD, BETTER, and BEST models. Beginning with molded spring protection on both sides of the coils, a cotton pad, and a layer of bonded cotton follow. The needle-punched cotton pad lies under a .5-inch layer of comfort foam, which is topped with a .75-inch layer of heavy density foam. Next the pillow-top is created from a layer of quilted cotton and a 1.5-inch layer of super soft comfort foam topped with a 2-inch layer of antimicrobial fiber. Finally the fine damask cover is quilted to create a supreme pillow-top/firm mattress. This SUPREME mattress incorporates our amazing plush pillow top on one side and firmer mattress non-pillow top on the other side. Want a different feel? Just flip the mattress. An idea whose time has come, especially when you consider the poor value that a one sided "no flip" mattress offers. 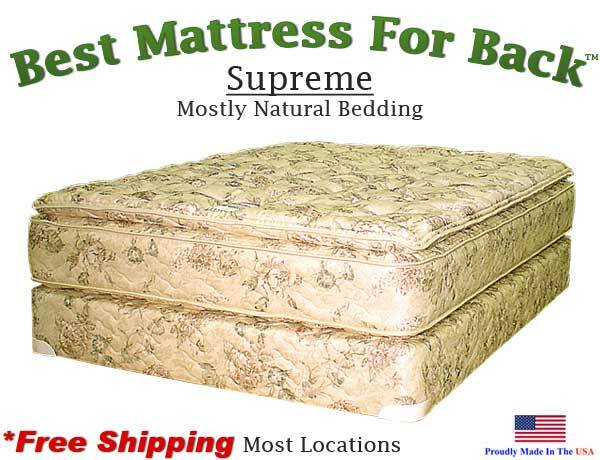 Our SUPREME model sold here offers low price with plush pillow top but supportive feel and a firmer feel with tighter quilting on the other side. Our mattress has 2 sleep sides, you can turn it over. Plush on one side and firm on the other side, choice is nice. DISCLAIMER: NOT A MEDICAL DEVICE: Please note, we do NOT sell our Best Mattress For Back as a medical device, a cure or a substitute for seeking professional medical advice. 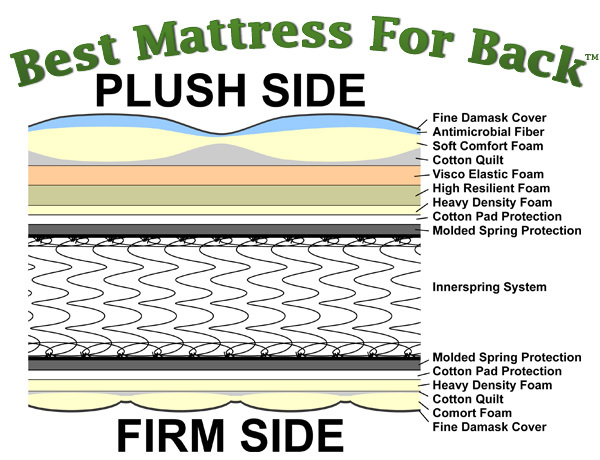 We sell our Best Mattress For Back as an outstanding quality mattress or mattress set only. SHIPPING: Your Your Best Mattress For Back will arrive as a curb only drop which means that you will need two strong people to take it off of the truck and bring it indoors. Our shipper calls and makes an appointment with you. White Glove shipping is available. If you choose White Glove, they will generally bring your Best Mattress For Back (or set) inside and in some cases take away the packing materials.